The Kumbh Mela in India is as mesmerizing as it is spiritual. This ancient northern Indian festival is a meeting of mystical minds. The largest religious gathering in the world, the Kumbh Mela brings Hindu holy men together to discuss their faith and disseminate information about their religion. It's attended by millions of people each day. In recognition of the festival's importance, in December 2017, UNESCO included the Kumbh Mela on its Intangible Cultural Heritage of Humanity list. Where is the Kumbh Mela Held? The Mela takes place on a rotational basis in four of the most holy Hindu places in India -- on the banks of the Godavari river in Nashik (Maharashtra), the Shipra river in Ujjain (Madhya Pradesh), the Ganges river in Haridwar (Uttarakhand), and confluence of the Ganges, Yamuna, and mythical Saraswati rivers in Allahabad/Prayag (Uttar Pradesh). The confluence of these rivers is referred to as the Sangam. When is the Kumbh Mela Held? In each location once every 12 years. Theoretically, it should happen every three years in a different place. However, the exact time and place of the festival depends on astrological and religious considerations. This means that the Mela sometimes happens only a year apart at the different sites. There is also a Maha Kumbh Mela, which is held once every 12 years. In between, in the sixth year, the Ardh Kumbh Mela (half mela) takes place. In addition, in Allahabad, every year the Maagh Mela is celebrated in the month of Maagh (as per Hindu calendar during mid January to February) at the Sangam. This Maagh Mela is referred to as the Ardh Kumbh Mela and Kumbh Mela when it happens in the sixth and twelfth years, respectively. The Maha Kumbh Mela is considered to be the most auspicious mela. It always occurs in Allahabad, as the confluence of the rivers there is considered to be particularly holy. The Ardh Kumb Mela occurs in both Allahabad and Haridwar. 2019 Ardh Kumbh Mela in Allahabad, from January 14 to March 4. Legend has it that the gods once lost their strength. In order to regain it, they agreed with the demons to churn the primordial ocean of milk for amrit (the nectar of immortality). This was to be shared equally between them. However, a fight broke out, which went on for 12 human years. During the battle, the celestial bird, Garuda, flew away with the Kumbh that held the nectar. Drops of nectar are believed to have fallen in the places that the Kumbh Mela is now held -- Prayag (Allahabad), Haridwar, Nashik, and Ujjain. The sadhus and other holy men are an integral part of the Mela. Pilgrims who attend it come to see and listen to these men, in order to gain spiritual enlightenment. 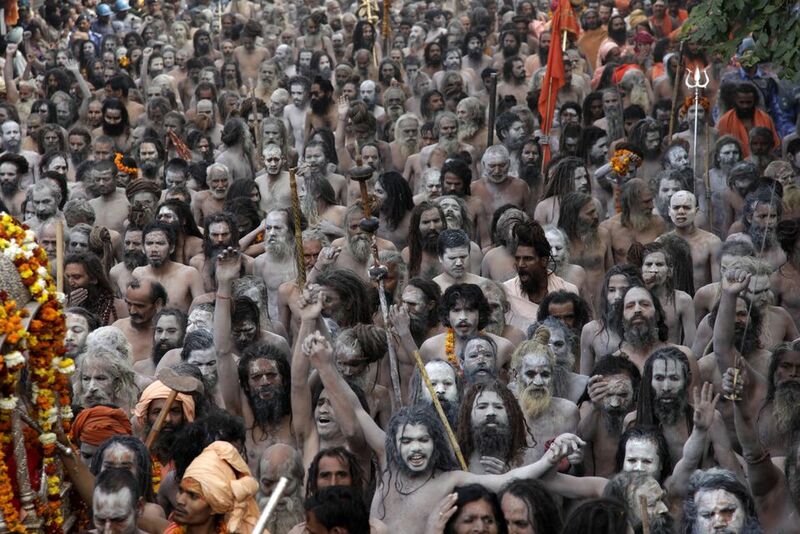 Nagas -- naked sadhus who smear their bodies with ash and have long matted hair. Constant exposure to the weather makes them resistant to temperature extremes. Their eyes are bloodshot from constantly smoking charas (marijuana), which they believe aids enlightenment. Urdhwavahurs -- who have emaciated bodies from rigid spiritual practices. Parivajakas -- who have taken a vow of silence. Shirshasinse -- who remain standing, sleep with their heads resting on a vertical pole, and meditate standing on their heads. Kalpvasis -- who remain by the river banks and devote their time to meditating, performing rituals, and bathing numerous times a day. What Rituals are Performed at the Kumbh Mela? The main ritual is the ritual bath. Hindus believe that submerging themselves in the sacred waters on the most auspicious day of the new moon will absolve them and their ancestors of sin, thus ending the cycle of rebirth. Pilgrims start lining up to bathe from around 3 a.m. on this day. From a tourist perspective, the Kumbh Mela is an unforgettable -- and daunting -- experience! The sheer number of people there can be off-putting. However, dedicated arrangements are made, especially foreigners. Special tourist camps are set up, providing luxury tents with attached bathrooms, guides, and assistance for excursions. Tight security is also in place. To see the biggest spectacle of sadhus, make sure you're there for a Shahi Snan (Royal Bath), which happens on certain auspicious days. There are usually a handful of these days during each Kumbh Mela. The dates are announced in advance. Another major event is the arrival of the various sects of sadhus, in procession with much fanfare, at the start of the Kumbh Mela. January 21, 2019: Paush Purnima. February 10, 2019: Basant Panchami (Third Shahi Snan). February 19, 2019: Maghi Poornima. March 4, 2019: Maha Shivratri. See some of the weird and wonderful sights of the Kumbh Mela in this photo gallery.